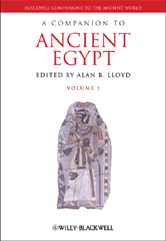 This companion provides the very latest accounts of the major and current aspects of Egyptology by leading scholars. It is delivered in a highly readable style and extensively illustrated; published in two volumes, it offers unprecedented breadth and depth of coverage, giving full scope to the discussion of this incredible civilization. Provides the very latest and, where relevant, well-illustrated accounts of the major aspects of Egypt's ancient history and culture. Covers a broad scope of topics including physical context, history, economic and social mechanisms, language, literature, and the visual arts. Delivered in a highly readable style with students and scholars of both Egyptology and Graeco-Roman studies in mind. Provides a chronological table at the start of each volume to help readers orient chapters within the wider historical context.